A cup of your favorite coffee is waiting for you when you open your eyes in the morning. That’s fantastic? The Barisieur designer tea and coffee maker with alarm clock will help you achieve it. 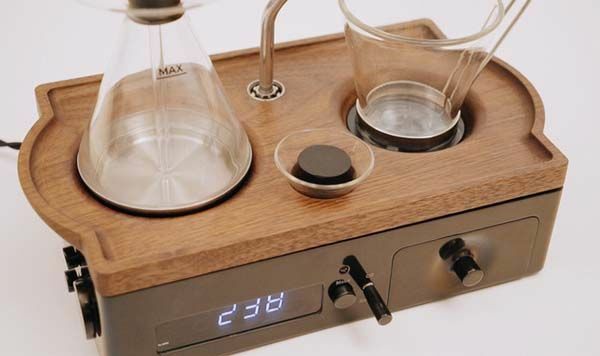 The Barisieur is a uniquely designed, automatic coffee and tea brewer that measures 9.8 x 6.5 x 10 inches. As we can see from the images, the tea and coffee maker shows off a unique and eye-catching appearance which delivers a combination of modern aesthetics and vintage design plus a portable profile in order to decently stand on your nightstand. The tea and coffee brewing system consists of multiple parts including a glass boiling vessel base & rubber bung, a glass transportation tube, a reusable stainless steel filter, glass funnel, a stainless steel arm and an exquisite glass cup with stainless steel handle. Before going to bed, you need to place these parts in their right place and pour water in the left boiling vessel and add your favorite coffee grounds or loose tea on the filter just like a solemn ritual. Based on the alarm which you have set, the brewer has the ability to automatically brew a cup of delicious coffee or tea. 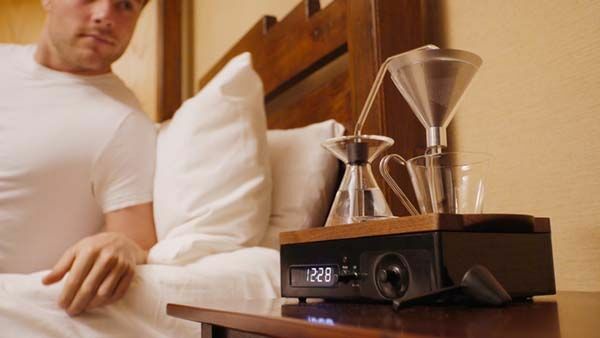 When the integrated alarm clock wakes you up, you can drink it in the first time. Of course, the Barisieur can also brew coffee or tea whenever you want. 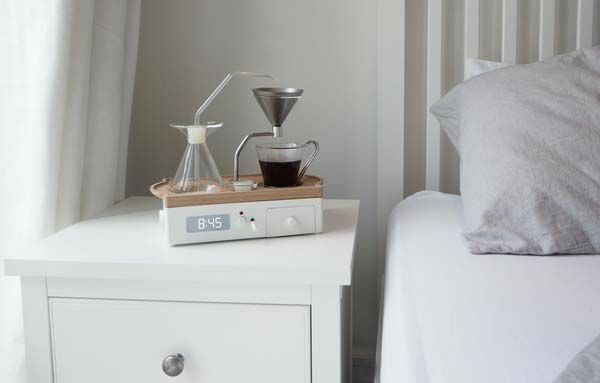 Furthermore, the tea and coffee maker also features a black bakelite base that contains integrated alarm clock and a sealed drawer holding coffee, tea or sugar for easy access. Moreover, a specially designed milk vessel keeps milk cool overnight or throughout the day. Apart from these, using a built-in USB port, the Barisieur acts as a charging station to charge your mobile devices. The crowdfunding campaign for Barisieur is ongoing on Kickstarter. You can pledge £256 (approx US$370) to preorder the designer tea and coffee maker. It will be shipped in June 2017. BTW, also don’t miss Auroma One smart coffee and more related cool stuff by following tags.